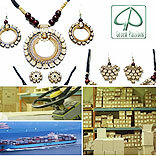 Jewellery retailing involves heavy-duty logistics management. Jewellery retail requires efficient and foolproof security measures that ensure safety to the maximum. So how do the jewellery retailers and logistic companies, manage to maximise the jewellery supply chain efficiency, make sure the jewellery is secure and intact and enable the safe and timely delivery. Despite India being a market for great trade in gems and gold jewellery, there are not many logistic companies that cater to the segment. The over all logistics industry is worth USD 3.5 trillion, in which the Indian market is worth USD 135 billion and the jewellery logistics market constitutes USD16 billion. The logistics base in the west is a very old one but in India it started in 1981. Brinks Inc. a US based company, entered India through a JV to form the Brinks Arya India Private Limited. Subsequently, Lemuir Express entered, in 1983. At that time, the logistic services were mainly offered to the diamond industry and not the whole jewellery market per se. Currently, the key players in the gems and jewellery logistics business are JK Malca-Amit, Brinks Arya, B V Chinai and Lemuir Express. JK Malca-Amit has the maximum share of 42 per cent. Brinks Arya has 28 per cent and BVC has 22 per cent of the market share. From being a null business perspective 30 years ago, nowadays almost 95 per cent of gems and jewellery exporters avail logistic services. Most jewellery retailers hire 3PL (third party logistics) services for transportation as it becomes convenient for them to ensure safety. The jewellery pieces are carefully tagged, counted and sealed in the presence of authorised personnel and delivered to the authorised person. Strict documentation with signatures is maintained (for dispatching and receiving merchandise). A part or whole of the transportation process is outsourced, after including the provision for security. “Security measures are taken, like having an armoured vehicle which has a thick bullet proof glass and the vans are made of high quality steels. If this criterion is not met the insurance companies refuse to insure the vehicle” says Yogesh Bansode, General Manager, Operations, BVC. Until the jewellery pieces are tactfully packed and are safe, the entire investment in the logistics may be futile. Undoubtedly, all sorts of jewellery are precious and require special care while packaging. All measures are taken by the jewellery retailers to ensure that the precious merchandise is well protected and cushioned to avoid damage from jerks and accidents. At Gitanjali, jewellery pieces are packed in a tin box and all pieces are well protected by cotton, bubble wraps and other materials. Gaps in boxes are always stuffed and padded up for ensuring complete safety for the jewellery items. Cygnus follows different packing procedures for different forms of jewellery. The spokesperson for Gitanjali reveals that the company has never experienced the incidence of merchandise damage, during transportation, till date. At the time of hiring logistics services the jewellery retailers act in a cautious manner to choose their carrier, declare correct value and pay more freight. “We take full measures to see that there are no thefts, we have a 24 hours GPS system that always tracks our vehicles, so that we have an eye on the vehicles path. The doors of the vehicles are very heavy; of almost 30-40 kgs and can take 5mm shots as well. All these things keep the situation under control” adds Bansode. While applying for carrier policy, exporters should give the correct details of the worth of the cargo, the money involved should be clearly revealed. “Declaring the correct value of the goods to the carrier always helps. The carrier would charge a nominal amount and if the merchandise were lost, the insured would be stuck with the insurance company,” says Bansode. The premium is then finalised after all details are crystal clear and out on the table. Insurance companies give a slip that contains all the dos and don’ts in cargo insurance attached to the policy documents. When the jewellery pieces are received at the warehouse of a jewellery chain, the stock management team comes to play. Some jewellery pieces are tiny and have even tinier labels/ barcodes which are very difficult to read. Manually checking goods becomes an arduous and lengthy task with thousands of jewellery pieces per store. To enhance productivity and minimise manual work involved in time-consuming rotating inventories some jewellery retailers are using the RFID (Radio-frequency identification) technology. It helps them in managing the stock at the outlets and storage centre. The jewellery pieces are clubbed together in a set of hundred or more. Earlier the store staff had to unpack each item to manually read the tag. With RFID system in place the operator quickly reads the batch of items, with the help of the RFID desktop reader. “Tagging jewellery pieces with the help of RFID technology enhances reliability during shipping and receiving phases, and improves stock traceability,” says Bansode. There are many odds and ends that are a part of jewellery logistics. From the departure to the arrival of the carrier, a jeweller’s heart is in his throat. If the merchandise doesn’t reach in time or there’s a technical difficulty in the transport, a loss of hundred of crore is witnessed. Surely! Logistics regarding jewellery items isn’t a child’s play.